The re-farming of spectrum (i.e. its reassignment to services with a higher value), triggered by free-to-air television digitisation and the switch-off of analogue TV, represents a significant microeconomic reform. Digitisation has already transformed the television industry, and analogue TV switch-off will yield a ?digital dividend? for wireless broadband as well as further benefits to television itself. With soaring growth projections for mobile data traffic creating pressure for further spectrum allocations for wireless broadband, lessons learned from the digital dividend process are liable to influence government approaches to spectrum re-farming in future. This article considers the development, over two decades, of an original policy ?blueprint? for TV digitisation in Australia as a case-study in spectrum re-farming. While it is too early to judge its full effects, some preliminary lessons are drawn from the various approaches that have been considered and adopted or discarded along the way. The ?six channel block? configuration for terrestrial TV services, which will make the most efficient possible use of the remaining broadcasting services bands, with long-term advantages for viewers (who will require only one antenna for services) and broadcasters (whose identical coverage areas may assist with future innovation of the free-to-air television platform). Since the early adoption of AM radio in the 1920s, Australia has been slow to introduce broadcasting innovations. It delayed the introduction of analogue television, FM radio and pay TV for decades after the United States. With the emergence of digital terrestrial television technology, the country rejoined the ranks of early movers and developed, step by step and over an extended period, a digitisation blueprint of its own. Now it is on-track to turn off its last analogue television service only four years after the United States. Its digital dividend plan even provides a blue-print suitable for later-moving economies to copy or adapt, complete with opportunities to leapfrog Australia by adopting more advanced technical standards. Given the enduring consequences this blueprint will have for our communications sector, what is there to learn from Australia?s experience as an early mover in television digitisation? In this article, I have examined the digital dividend as a case-study in spectrum re-farming. Figure 1 - Boundaries of Australia?s UHF broadcasting allocation, showing the 126MHz ?digital dividend? and the location of the APT 700 MHz frequency division duplex (FDD) plan (698-806MHz). Australia's approach to the digital dividend developed in three discernible phases over an 18-year period. Phase 1 (1993-2000) was exclusively concerned with digitisation of the analogue television service. It was driven by television industry requirements and made detailed provision for the ?simulcasting? of analogue and digital television as a prelude to the eventual replacement of analogue. Phase 2 (2001-2007) was a period of consolidation and learning from experience. Digital television was switched on in most major markets and the government reviewed and adjusted the regulatory settings where appropriate to increase take-up. During Phase 3 (from 2007) the focus turned to how analogue television might be switched off. It was only at this stage that the nature of any digital dividend resulting from the return of so many television channels received detailed attention, and analogue switch-off came to be recognised as a means to an end and not simply a goal in itself. The article describes the major developments during each phase and makes some observations about what has been learned along the way. It also considers a couple of alternative paths that were identified but not taken. These highlight the risks of reaching premature conclusions about the ultimate goal and benefits of spectrum re-farming. Lastly it makes some observations about the future, noting that the job of realising Australia?s ?digital dividend? is not yet done. Key planks of the eventual policy for digitalisation of analogue television in Australia were developed between 1993 and 1997 by a joint working party of engineers from the television industry and the federal communications portfolio: the Australian Broadcasting Authority (ABA) Specialist Group on Digital Terrestrial Broadcasting. Membership was limited by invitation to broadcasters and television equipment suppliers, though telecommunications representatives participated. Findings and recommendations were developed by consensus. Despite publication of a first report for comment in 1995, there is little evidence of interest from other industry sectors (ABA 1997). In other words, the threat of competition from emerging new platforms was what pushed the Australian broadcasting industry into early adoption of digital technology. The full 7MHz channel was required to deliver HDTV programming for all or part of their program hours (ABA 1997 pp 23, 26). The Final Report contains little speculation about what might be done with the spectrum handed back after analogue switch-off. As digital TV could use the vacant, interstitial channels required for analogue television operation, introduction of digital television could be accomplished using existing TV broadcasting services bands spectrum, with analogue channels eventually vacated following a period of simulcasting. Some VHF TV Bands were known to be unsuited to digital television and would be available for other uses. Otherwise, the findings imply that it is too soon to decide the fate of vacated analogue channels but that further development of the terrestrial television service would be the likely use (ABA 1997, Findings 16.5 and 16.6, pg 27) . In 1998 and 2000 the federal government passed two major pieces of legislation relating to digitisation of the analogue television platform. The simulcast period to run for a statutory minimum period (nine years in the case of metropolitan markets) or such longer period as the government determined. Explicit provision for the ultimate return of the analogue channel after the simulcasting period. The government also helped with the cost. As well as paying for the digitisation of the two national networks, it announced a Regional Equalisation Plan, commencing in 2000-01, to provide up to $260 million over 13 years to commercial broadcasters in regional and remote Australia. The sum represented 50% of the estimated costs of digitisation. Though the metropolitan commercial broadcasters were expected to pay their full digitisation costs, the prohibition on new commercial TV entrants was extended until the end of 2006 in recognition of their expensive transition to digital (Alston 2000). Unlike the smooth ride enjoyed by the Specialist Group process, the Government?s policies were widely attacked by other parts of the media industry. Criticism focused on the extension of the moratorium on further commercial television broadcasting licences and the ?free? loan of an entire 7MHz channel to each broadcaster. Much was made of European precedents, where multiple analogue TV services were required to share digital multiplexes and each given sufficient bandwidth only to carry a Standard Definition (SD) TV service.Facing public opposition and lobbying from other parts of the media, in December 1999 the government announced what were in effect two substantial departures from the Specialist Group?s recommendations (Alston 1999b). First, it tightly restricted how commercial broadcasters could use their 7MHz channels. If HDTV was the rationale for giving them an entire channel each, then HDTV would be all commercial broadcasters would be allowed to transmit. Subsequently, doubts about the effect on receiver prices of permitting broadcasters to transmit in HDTV format alone led to a requirement that the analogue service be transmitted in SDTV format as well. The result was the so-called ?triplecast? requirement, with commercial broadcasters required to transmit the same content in three separate technical formats: analogue (PAL), SDTV and HDTV. The government?s second response was to announce the sell-off of vacant digital television channels to new players, but on very restricted terms. The Specialist Group had found that six digital channels could be planned in each area during the simulcast period. By taking a few short-cuts (notably use of very wide area single frequency networks) the ABA was able to find a minimum of seven channels in all areas: five for simulcasting plus two vacant channels. The government invited potential new market entrants to use the digital channels ? known as channels A and B ? to provide anything other than commercial television broadcasting services. The amendments in 2000 of the Broadcasting Services Act 1992 inserted a new Schedule 6 containing a content licensing scheme for ?datacasting services?. The licences authorised any use of a digital television channel to transmit digital data, subject to a series of prohibitions and restrictions to prevent the service from resembling commercial television. Television programs falling into a comprehensive range of popular commercial genres were prohibited. News, weather and financial or business information bulletins were permitted but only to a maximum of ten minutes in length, with a requirement that the content not be refreshed or updated for at least thirty minutes. The broadcasting regulator was given powers to keep the genre boundaries current. In the fine detail of the amendments were measures that would, in effect, have extended the moratorium on new commercial TV stations beyond 2007. The legislation created a new type of apparatus licence called a datacasting transmitter licence, designed to authorise services using channels A and B, with a potential tenure of up to 15 years. Sunset provisions in the legislation meant that after 2007 a datacasting licensee could also use the channel for any other type of broadcasting service for which it could obtain a licence. But as there was no legal mechanism to upgrade to a commercial television broadcasting licence, allocation of channels A and B for datacasting would have precluded additional commercial television networks from using the broadcasting services bands for up to fifteen years. The government promoted the idea that Australia might become a world leader in datacasting applications of digital television transmitters. It identified possible uses, such as electronic program guides, enhancements to television programs, video and audio on demand (or near on demand), broadcast of popular websites, multimedia information and entertainment services, ?Internet/TV hybrids? and interactive services such as competitions, shopping, banking, gambling and gaming (Alston 1999a). The Australian Communications Authority (ACA) started work on an auction of datacasting transmitter licences but the Minister called it off in May 2001, due to factors including a lack of competitive tension (Alston 2001). Given the criticism of the government?s policies, it is insightful to examine the most cogent policy alternative advanced at the time to the ideas of the government and the Specialist Group. This is found in the Productivity Commission?s 2000 report on broadcasting regulation in Australia, which among other things recommended radical reform of broadcasting spectrum planning and licensing (Productivity Commission 2000). The Commission?s recommendations for TV digitisation should be understood in the context of its wider proposed changes to broadcasting regulation. One effect of these proposals would have been the conversion of broadcasters? spectrum holdings into tradable spectrum licences. A broadcaster would be able to sell its spectrum while retaining its broadcasting content licence ? for example, if it found a more spectrum-efficient way of delivering its services. Two years prior to switch off, all remaining spectrum used for analogue television broadcasting to be planned and sold, with possession after switch-off. The Commission?s recommendations were not accepted, although in 2004 the government invited submissions on another recommendation from the report: that responsibility for the planning of ?broadcasting services bands? spectrum should be moved from the ABA to the Australian Communications Authority. This process resulted in the 2005 establishment of the Australian Communications and Media Authority (ACMA). From now on, responsibility for both broadcasting spectrum planning and planning for services with competing claims on the broadcasting services bands would be vested in the same expert body. Digital television was launched in 2001 with little fanfare, a small range of set-top box receivers and few attractions beyond what could be found in most homes via the analogue service, but the rapid evolution of consumer devices soon changed this. Digital signals looked and sounded better on the new LCD and plasma screens that were replacing cathode ray tubes in shops. Sales of integrated digital TVs overtook set top box sales; analogue-only receivers, though never banned, disappeared from shops because of market forces alone. 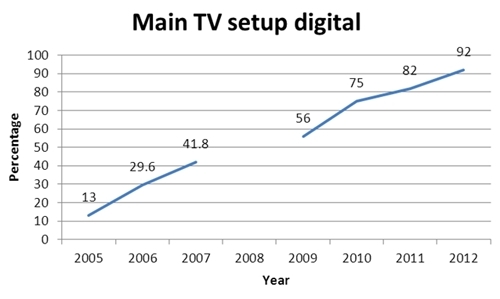 Viewers were paying for better TV sets, with rising digital penetration an incidental benefit. made provision for both the HDTV requirement and any restriction on the number of multichannels to fall away at the end of the simulcast period. an earlier government decision to count services with video display resolutions as low as 576p as HDTV, in addition to the more data-hungry 720p or 1080i resolution commonly associated with the format overseas. Combined with the 2006 amendments, the result was the progressive expansion of the free-to-air national and commercial ?bouquet? from the maximum of five services available in analogue to the current 17 services. While some viewers complained that free-to-air HDTV often looked no better than SDTV, allowing multi-channels would increase the competitiveness and audience appeal of the digital TV platform. Modest levels of commercial interest in the concept of datacasting licences continued throughout the period, with an extended commercial trial of the medium in Sydney. In 2006-07 the government revisited the idea of auctioning channels A and B, this time offering one of the two licences for either datacasting or, alternatively, for use as a mobile television channel. Changes to legislation clarified that a mobile television service would be permitted to carry pay TV services to mobile receivers. The ACMA began work on another auction instrument but was overtaken by a change of government in late 2007. Meanwhile, the new ACMA was facing the challenge of soaring projected demand for spectrum capacity for wireless access services (?WAS? ), including broadband wireless services. WAS service providers and equipment manufacturers were seeking spectrum in bands that offered wide bandwidth, good building and distance propagation and small antenna sizes. Unfortunately, the bands with varying combinations of these properties (450 MHz ? 6 GHz) included most of the more valuable parts of the radiofrequency spectrum, which were often heavily used by existing commercial and government users. In February 2006, the ACMA released a discussion-paper, Strategies for Wireless Access Services. The paper invited submissions on candidate bands for WAS and in December 2006 the Authority published its findings in a second paper, Strategies for Wireless Access Services: Spectrum Access Options. This paper identified the entire UHF television allocation, i.e. 520-820MHz, as a ?long-term? possibility for WAS services. Phase 3: Analogue switch-off and the ?digital dividend? The year 2007 is significant as the year the first Apple iPhone was launched in the United States, formally arriving in Australia the following year. Enthusiastic global adoption and emulation of this device would turn the issue of spectrum for broadband wireless services from an esoteric policy problem into a bread-and-butter consumer issue. In Australia, 2007 also saw the election of a new government with a platform of setting firm dates for the clearance of analogue television. Over the next three years, the goal of analogue TV switch-off would first come to be seen clearly as part of a larger process designed to yield the ?dividend? resulting from full digitisation. In early 2008 the government announced that all free-to-air television broadcasters in Australia would complete the switch from analogue transmission to digital-only transmission by the end of 2013 (Conroy 2008a) A region-by-region timetable for the digital switchover followed, with the first market, Mildura/Sunraysia, to switch off on 30 June 2010 (Conroy 2008b). Details of how this would be achieved were disclosed progressively in a series of announcements leading up to the Mildura switch-off. working with industry to allow for a smooth transition to digital TV (Conroy 2009). This funding related to the first four switch-over regions only, but the model ? of a ?household assistance scheme? offering direct assistance to pensioners and a public information campaign to help other analogue-only households convert at their own expense ? would later be extended to the remaining switch-over areas. A second challenge was how to help viewers in areas with deficient digital signals. Notwithstanding the ?same coverage test,? which had ensured that digital coverage matched planned analogue coverage, the different reception characteristics of analogue and digital TV meant that some householders who relied on poor or marginal analogue reception would not necessarily be able to receive, or reliably receive, digital services. A related challenge was what to do with hundreds of self-help terrestrial re-transmitters and analogue ?black spot? solutions in small communities around Australia. As these were not directly provided by broadcasters, no one to date had been under any legal obligation to convert them to digital. Early in 2010, the government announced a new satellite television service for viewers in blackspot areas. Rather than paying to digitalise self-help services, the satellite would offer the same choice of television services as people in the largest cities, including, for regional Australians, re-transmission of local news broadcast within their licence areas. In the 2010 budget, $375.4 million over twelve years was earmarked for the Viewer Access Satellite Television (VAST) service. Viewers who lost access to analogue terrestrial re-transmissions would be eligible for a subsidy towards the cost of upgrading to VAST (the ?satellite subsidy scheme?). However, some self-help re-transmissions would be converted to digital. Commercial television broadcasters ? concerned to prevent migration of their terrestrial audiences to separately-owned satellite services ? were free to upgrade, at their own expense, their choice of the existing terrestrial re-transmission sites or install new terrestrial infill sites, on the condition that the site transmitted full suite of digital services (including the national services) (Conroy 2010a). By June 2010, most of the key measures were in place for the area-by-area switch-off of the analogue television system. However, the decision to go with a ?big? satellite solution instead of assistance with conversion of self-help facilities would have a knock-on effect. Since the inception of television in Australia, the smallest regional and remote television markets had typically received fewer TV services than the major cities. The comprehensive VAST service offering placed pressure on the smallest terrestrial services to equalise their terrestrial offerings or face audience leakage to the satellite, and in June 2010 the Minister announced a ?partnership? with regional commercial broadcasters to achieve equalisation of services nation-wide, at a cost to the government of $34 million over four years (Conroy 2010b) Thus the historical aspiration of ?equalisation? of television services across Australia was fully realised at last. It is striking how long the Australian policy debate about TV digitisation focused on expanding the supply of digital broadcasting channels. In other early-moving countries, the trend was for the identification and clearance of larger, contiguous blocks of spectrum for uses other than broadcasting, notably broadband wireless communications. The United States moved from very early on to plan and allocate a large block of UHF spectrum in the range 698-806 MHz for a mixture of commercial broadband wireless and both broadband and narrowband public safety uses, a fact even touched on by the Productivity Commission in 2000. Early-moving European countries also sought to clear large spectrum blocks. The earliest, piecemeal identification of nation-specific dividends by individual European states, such as the UK, was to founder on the realisation that greater benefits would accrue if states could agree to a common harmonised allocation across national boundaries; European countries presently converged on the idea of a harmonised UHF broadband wireless ?dividend? in the range 790-862MHz. A rare public acknowledgement of the choices facing Australia can be found in a 2006 paper from an ACMA engineer, which canvassed the alternatives of treating the vacated analogue TV channels in situ as the digital dividend (an option helpfully nicknamed ?Swiss cheese? ), or retuning the digital services so as to pack them together as closely as possible and yield a larger block of vacant spectrum for a potentially wider range of uses (?Cheddar?) (Gellatly 2006). A limitation of Swiss cheese is that any dividend would be technically configured for digital television only. An advantage of Cheddar is that the larger contiguous blocks would open the door to differently configured uses such as harmonisation with international allocations for wireless broadband. Over the period 2008-09, the government postponed a final decision on whether to proceed with the allocation of channels A and B while it considered the related questions of how much spectrum would be required post-analogue for the television system and how much spectrum, and how configured, might be required for other services. In January 2010 it released a Green Paper (DBCDE 2010) in which it embraced the overseas trend to use broadcasting spectrum more efficiently by reorganising, or ?restacking?, television services to create a contiguous block of cleared spectrum, thereby expanding the number of potential uses of the cleared spectrum. The digital television switchover and digital dividend planning process is not as advanced in region three as it is in the United States and Europe. It is therefore possible for region three economies to work together to develop digital dividend spectrum arrangements that maximise the ability to utilise customer and network equipment developed overseas and to facilitate global roaming should dividend spectrum be used to provide such services. Driven by the imperative of analogue switch-off, Australia was already active in what was then the APT Wireless Forum (since renamed the APT Wireless Group, or AWG) exploring just this opportunity. It was common ground that the only other band plan in existence compatible with the region?s digital dividend, the US 700 MHz plan, was both fragmented and inefficient. From 2009, with significant ACMA input, the APT Wireless Forum began developing an optimised band plan for the 698-806 MHz frequency range that maximised the amount of spectrum available for mobile broadband use while ensuring compatibility with adjacent services. By late 2011 the AWG had agreed on arrangements for two band plans: a time division duplex (TDD) arrangement between 703-803 MHz and a frequency division duplex (FDD) arrangement providing 2 by 45 MHz of spectrum between 703 and 803 MHz, with a 10 MHz centre gap and upper and lower guard bands of 3 and 5 MHz respectively2. (The guard bands are to manage the potential for interference with adjacent services. Centre gaps (sometimes referred to as ?mid band gaps?) are a characteristic of FDD spectrum arrangements permitting simultaneous transmission and reception of signals.) The success of the AWG?s work in developing the APT 700 MHz band plan has since become clear from its wide adoption around the world, not only within the Asia-pacific region but also in Latin and South America. There is also potential for the APT 700 MHz band plan to be adopted (either in whole or in part) in Africa, the Middle East and even Europe3. The Green Paper also considered the capacity of the remaining broadcasting bands if Australia harmonised with 698-806 MHz dividend, presenting findings from the ACMA and consultants suggesting up to six television services at each site could be accommodated. Channel B was to be sacrificed to reach the magic number of 126MHz. Provision of 14 MHz of VHF spectrum for the regional expansion of digital radio (ACMA 2010). The fine detail of configuring the 700 MHz spectrum licences was settled between 2010 and 2011 via the processes of ACMA consultation with affected incumbents (ACMA 2011a), a final ACMA recommendation to the Minister and a Ministerial reallocation determination confirming the frequency, geographical and chronological dimensions of the new properties (Declaration No. 1 of 2011) as required by the Radiocommunications Act 1992. These processes confirmed Australia would harmonise its 700 MHz broadband allocation with the APT 700 MHz plan for FDD (as shown in Figure 1). Figure 3 - APT 700 MHz band plan showing Australian lot configuration (outer guard bands not shown). The nine licences (labelled A-I), each consisting of 5MHz paired, will be auctioned in April this year. The innovative six-channel block configuration for the remaining television bands emerged from detailed ACMA consultation with the broadcasting industry about the planning principles that should govern the re-stack. Commercial broadcasters developed the proposal in preference to the ACMA?s default ?minimal moves? model, which would have preserved the existing wide spread of TV frequencies in many areas in the interests of minimising costs and disruption. An account of the pros and cons of both options and the ACMA?s final decision is found in the May 2011 paper Clearing the Digital Dividend: Decisions on planning principles for restacking digital television channels (ACMA 2011b). Ensuring that consumers are well informed about any changes in their local area and what it means for them (Conroy 2012a). As at the time of writing, some details of this program are yet to be announced. Finally, a number of spectrum planning and allocation issues flowing from analogue television switch-off remain unresolved. These include the future uses of vacated VHF Band I and II spectrum and UHF spectrum in the range 806-820MHz. The ACMA is currently considering potential uses of 806-820MHz as part of a wider review of spectrum in the band 803-960MHz4. There has also been no decision on the ultimate use of the planned, vacant ?sixth channel,? with the Government most recently (in November 2012) affirming that potential uses would be considered in the long-term ?in light of the Australian Communications and Media Authority?s assessment of future broadcasting technologies?. In the meantime, ongoing transmission of community television broadcasting services or trial services will continue at a few key sites at least until 31 December 2014 (Conroy 2012b). In the 1990s, the idea of turning off the ubiquitous analogue TV service seemed almost quixotic. With hindsight, both the means and the ends of the enterprise were only partly apparent at the time. It is worth recording the high level of parliamentary bipartisanship on most of the major amendments described in this article. Through a number of iterations of policy, three successive governments gradually developed a complex and ambitious microeconomic reform blueprint5. That there were some false starts (triplecast) should not surprise. There is also much that with hindsight helped realise the digital dividend sooner (for example, early government subsidisation of the regional broadcasters? digital roll-out). Where spectrum re-farming is concerned, early moving nations must balance the benefits to industry and consumers of taking up new technologies against the risks of getting too far ahead of, and falling out of step with, other countries. The UK?s false start on the identification of a ?digital dividend? block is a case in point. The benefits to Australia of harmonising its spectrum arrangements with larger trading blocs suggest that the perennial Australian challenge with early adoption of technology is to ?lead from the middle? rather than get too far ahead. The risks of moving early to pre-empt the outcome of iterative international processes can be illustrated by some ?counterfactuals?. What if all of the UHF broadcasting band had been retained for digital broadcasting? An apparent expectation of the Specialist Group was that UHF channels freed up by analogue TV switch off would most likely be retained for broadcasting use. Depending on political decisions about the use of those channels, this option could have provided abundant spectrum for major future upgrading of technical standards, including with the use of the simulcast model. It says a lot for the accelerating pace of change in electronic communications that policy discussion of digital television technical standards evolution is already becoming timely. As a digital early mover, Australia adopted the then world?s best DVB-T transmission standard, from the European DVB family of television standards, and the MPEG-2 compression standard. There has since been widespread global adoption of the more efficient MPEG-4 compression standard, to the point that most TV receivers sold in Australia today are MPEG-4 compatible. The successor standard to DVB-T, DVB-T2, is still relatively new but has already been deployed in a number of countries, including the United Kingdom and New Zealand. Use of MPEG-4 and DVB-T2 would double the carrying capacity of a 7MHz channel relative to DVB-T/MPEG-2. Retention for television of the vacated analogue television channels could undoubtedly have assisted with the rapid introduction of more advanced standards. That other early moving countries have all chosen instead to free up larger, contiguous blocks of UHF spectrum, mainly for mobile broadband purposes, suggests Australia would have paid a price in terms of the total amount of spectrum available sub-1GHz for mobile broadband. While apparently accepting the demise of ?Swiss cheese,? the TV industry has continued to argue for some additional spectrum for future standards evolution. The digital dividend blueprint constrains but does not preclude future standards evolution, with the ultimate use of the sixth channel a significant future decision-point for government. By removing differential coverage objections to moving content between broadcaster multiplexes, the decision to adopt the six-channel block plan may also increase the long-term options for technical standards evolution. For example, content could be more easily shifted between existing multiplexes, or between these multiplexes and a new multiplex, including as part of a migration to higher technical standards. For a fuller account of these issues see the recent ACMA discussion paper, Beyond Switchover: the future technical evolution of digital terrestrial television in Australia (ACMA 2012). What if channels A and B had been sold for datacasting? With seven rather than six digital TV services at each site, harmonisation with the APT 700 MHz band plan would have required major compromises in broadcasting planning. This would have imposed additional costs on broadcasters (e.g. through wide-area SFNs, or reduced multiplex bit-rates) and viewers (e.g. through migration of many more households to satellite). Though not impossible, it would have been very politically challenging. Conversely, making the broadcasting bands larger to accommodate the seventh channel (while using existing planning parameters) would have required, as a rule of thumb, either an additional 28MHz, or four TV channels, or possibly as much as 35MHz, or five TV channels, to be added to the top of the current proposed UHF upper boundary. 28MHz may be less than a quarter of the current 126MHz UHF ?dividend,? but its negative effect on Australia?s ability to harmonise with the APT 700 MHz plan would have been disproportionate. Inspection of Figures 1 and 2 shows that if the broadcasting upper boundary is moved up by 28MHz, six of the current proposed nine, 5MHz ?paired? spectrum licences, or two thirds of the UHF digital dividend, would be lost (five if a smaller guard band were tolerated). The situation would have been somewhat different had Australia sold one of the two licences for mobile television, as this would impose different planning constraints. However, as a generalisation, the government would have faced the same pressure to expand the minimum amount of UHF spectrum available for broadcasting. What if the government had implemented the Productivity Commission recommendations? In addition to selling channels A and B, adoption of the Commission?s recommendations would have resulted in further digital TV channels sold as it became possible to clear them. As such, the chances of harmonisation with the APT 700 MHz or any other known plan for wireless broadband would have diminished correspondingly. However, the Commission also recommended that the channels should be sold as fully tradable spectrum licences. Could secondary trading have produced a wireless broadband ?digital dividend,? in the likely event that this would have become a more efficient use for the spectrum than a sixth, seventh or eighth digital TV channel? The reasons for being sceptical on this score have to do with the diagram at Figure 4, which shows all digital television channels in use in a key Australian market, with channels A and B included. (In reality, the Commission?s plan would have seen yet more digital services in use as analogue channels were vacated). Comparison with the APT 700 MHz FDD plan (Figures 1 and 3) shows the very different pattern of spectrum usage between digital TV and broadband wireless. If its goal was to harmonise with part of the APT 700 MHz plan, a notional purchaser of Channel A would acquire only the 7MHz channels marked in red at the sites shown in Figure 4. These properties are obviously not configured for broadband wireless, nor could the licensee trade its way to an allocation suitable for broadband wireless without the cooperation of other broadcasters in the area, including but not limited to a sufficient number of other licensees with a mind also to convert to broadband wireless. If an Australia-wide broadband wireless allocation was desired, the picture would be further complicated by different ownership of broadcasting channels in different geographical areas. Unaided, markets do not readily produce this kind of outcome. Figure 4 - Planned television channels in metropolitan and regional Queensland. 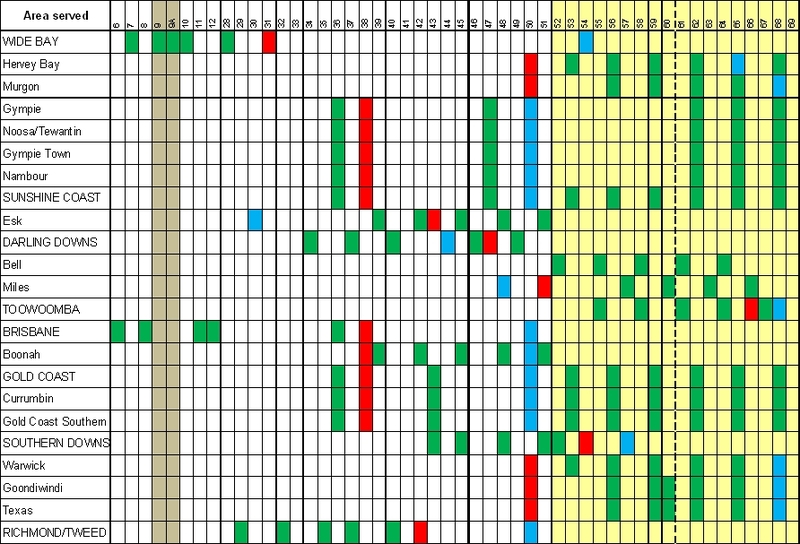 Channels in green denote channels in use by the five TV networks; channels in red and blue denote the two unassigned channels known as channels A (red) and B (blue). The yellow shaded area shows the location of the 126MHz ?digital dividend?. Comparison of the these diagrams highlights a more general challenge for spectrum planning, which is that the different and often incompatible spectrum requirements of different industries will, from time to time, require customised, probably government-mediated, solutions if spectrum is to migrate to its most value-adding use. Political lessons learned are not easily forgotten. They can cast long shadows over future policy. As early as 1998 the parliament showed a keen sensitivity to one risk in particular ? that an ostensibly superior standard might leave many viewers without services because of coverage shortfalls. At the time, the government was already grappling with migration of regional mobile phone subscribers from the analogue (?AMPS?) platform to digital, which had created exactly this problem in regional electorates. AMPS closure may help to explain the ?same coverage? requirement for digital TV, also why the ACMA was later funded to develop a signal measurement program of unprecedented scale. In the end, the decision to fund the VAST satellite has largely if not entirely addressed this issue, by ensuring everyone is able to obtain the same choice and quality of services. Soaring global demand for spectrum for broadband wireless has been the biggest issue in radiofrequency planning for the past decade. This year?s auction of 700 MHz and 2.5 GHz spectrum licences positions Australia well in what has become an international race to accommodate rising data traffic. Just as AMPS closure conditioned the government response to the Specialist Group report, so future political perceptions about TV digitisation, the reallocation process and the restack of digital TV services can be expected to colour political consideration of future demands for spectrum re-farming in heavily used bands. What will be appetite of future governments to help to bankroll spectrum reform or to endure any political pain if consumers are inconvenienced? As a case study, I expect Australia?s digital dividend blueprint to be of more than academic interest in the years ahead. The illustrations in the article are taken or derived from ACMA information and presentations. Special thanks to Dean Martin and Alex Kostic for their help with the illustrations. The views in this article are those of the author and do not represent ACMA views. Australian Broadcasting Authority. 1997. Digital Terrestrial Television Broadcasting in Australia: Final report of the work of the Australian Broadcasting Authority Specialist Group on Digital Terrestrial Broadcasting, Australian Broadcasting Authority, Canberra, 1997. Commonwealth of Australia. 2010. Australian Communications and Media Authority (Realising the Digital Dividend) Direction 2010, 9 July 2010. ACMA. 2011a. Draft Spectrum Reallocation Recommendations for the 700 MHz digital dividend and 2.5 GHz bands, Information paper, ACMA, May 2011. Alston, R. 1998. ?Government?s digital television bill passes Senate,? Media Release, Senator the Hon Richard Alston, 3 July 1998, 130/98. The 1998 amendments are substantially set out in schedule 4 of the BSA. Alston, R. 1999a. 'Digital Terrestrial Television Datacasting Services,? Media Release, Senator the Hon Richard Alston, 23 March 1999, 31/99. Alston, R. 1999b. Digital ? new choices, better services for Australians,? Media Release, Senator the Hon Richard Alston, 21 December 1999, 166/99. Alston, R. 2001. ?Datacasting licence auction cancelled,? Media Release, Senator the Hon Richard Alston, 9 May 2001, 72/01. Conroy, S. 2009. Media Release, Senator the Hon Stephen Conroy, 26 March 2008. Conroy, S. 2008. Media Release, Senator the Hon Stephen Conroy, 19 October 2008. Conroy, S. 2010a. ?Digital television Australia-wide,? Media Release, Senator the Hon Stephen Conroy, 5 January 2010. Conroy, S. 2010b. ?Full digital TV service for regional and remote Australia,? Media Release, Senator the Hon Stephen Conroy, 9 November 2010. Conroy, S. 2012A. ?Digital Dividend Auction Timing Released,? Media Release, Senator the Hon Stephen Conroy, 19 June 2012. Conroy, S. 2012b. ?Government moves to ensure quality Australian content stays on Australian television,? Media Release, Senator the Hon Stephen Conroy, 30 November 2012. DBCDE, 2010. Digital Dividend Green Paper, DBCDE, January 2010. Radiocommunications (Spectrum Re-allocation) Declaration No. 1 of 2011, 1 November 2011. Gellatly, Alastair. 2006. ?The Digital Dividend,? Radcomms 2006 Conference (11-12 December 2006). Productivity Commission. 2000, Broadcasting, Report No. 11, Ausinfo, Canberra. 1. Estimates derived from publicly-available data from two survey series, the ACMA?s Digital Media in Australian Homes series (2005-07) ( see for example http://www.acma.gov.au/WEB/STANDARD/pc=PC_311315 ) and the Department of Broadband, Communications and the Digital Economy: Quarterly Digital Tracker Survey [2009-] http://www.digitalready.gov.au/Households/info-centre/digital-tv-reports.aspx. The two survey series used different methodologies. 2. See the APT Report on ?Implementation issues associated with use of the band 698-806MHz by mobile services,? No. APT/AWG/REP-24, Edition: September 2011; also the APT Report on Harmonised frequency arrangements for the band 698-806MHz, No. APT/AWF/Rep-14, Edition: September 2010. 4. The ACMA released discussion papers on these bands in May 2011 and December 2012. The more recent discussion-paper, ?The 803-960 MHz band- Exploring options for future change,? seeks stakeholder views on proposals for the future of the 803 ? 960 MHz band. 5. R21 The Specialist Group commenced its work under the Keating Labor government and finished it after the Howard Liberal/National government won power in March 1996. Labor (Rudd; Gillard) returned to power in November 2007. Giles Tanner. 2013. The 'digital dividend' as a case study in spectrum re-farming. Telecommunications Journal of Australia, Vol 63, No 1, Article 391. http://doi.org/10.7790/tja.v63i1.391. Published by the Telecommunications Society of Australia and Swinburne University.